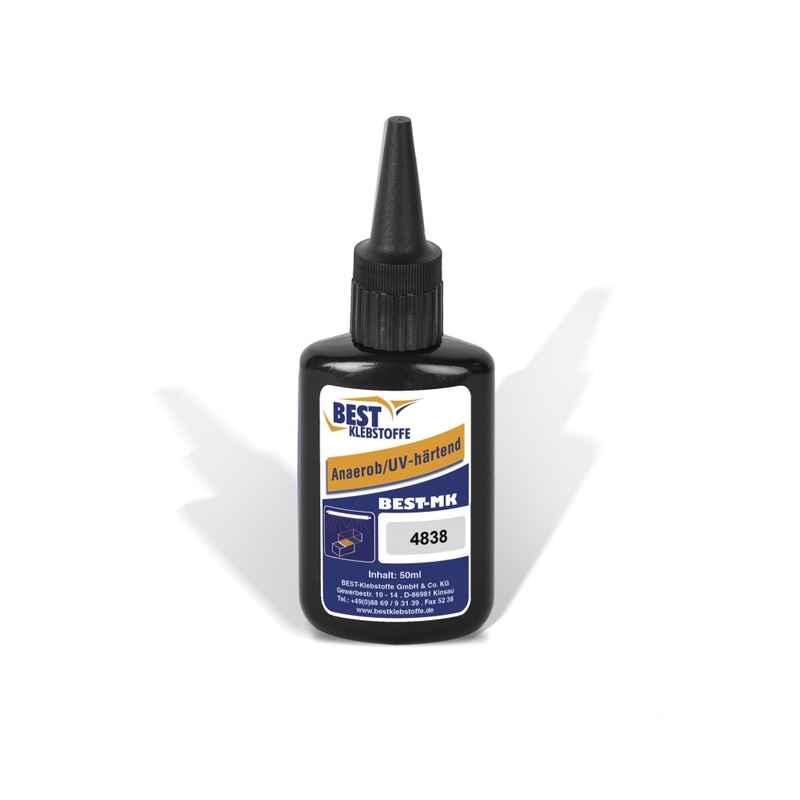 BEST-MK 4838 is a one-component, solvent free, high strength anaerobic- and light- curing adhesive based on di-methacrylate-ester. In addition to the anaerobic curing method the product can also be cured very fast by exposure to light with a wave length of 320 to 550 nm. BEST-MK 4838 is especially suitable for serial production and for applications recommending fixture time of only a few seconds. It is also recommended for fastening of coaxial adherends, e. g. bushings, bearings and shaft-hub-connections, sealing of gap sizes up to 0,03 mm in metal components and securing and sealing of threaded connections with a thread sizes up to R3″. In these applications excess adhesive can be cured by exposure to UV-light within seconds. Partial cure is reached instantly and allows fixing of the components and a production process without any delay for curing time. The product is especially recommended for bonding of metal with glass, glass with rubber, glass with ceramics and glass with glass. Expose the bonding surface through the glass-component. The adhesive not exposed to the light source cures anaerobically. BEST-MK 4838 combines high strength with very good chemical resistance. Due to the high strength of BEST-MK 4838 disassembly of threaded connections might not be possible without causing damage to screws or thread.